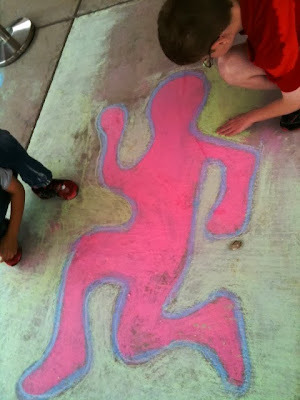 Crime Scene or Children's Chalk Mural? and doesn't convey the actual scenario whatsoever! by children for our annual field day. Field day translates into games on the lawn and getting sprayed with water hoses! Despite the rain the chalk mural was fantastic! because of privacy laws in schools.